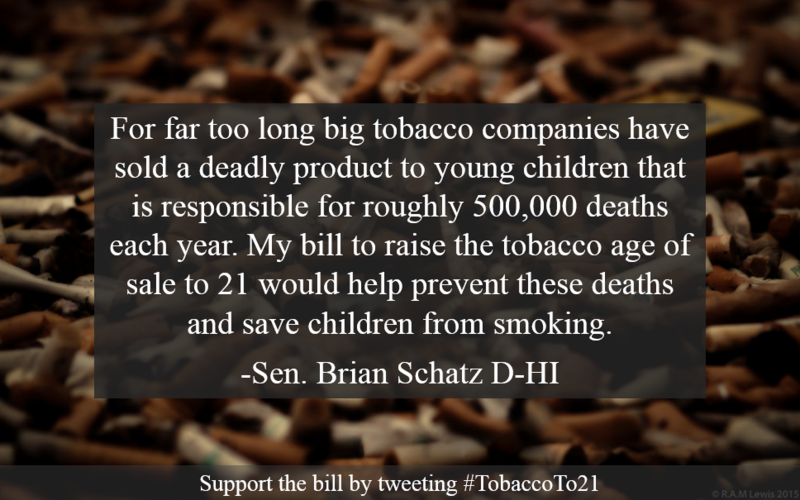 On Septemper 29, 2015 Senator Brian Schatz [D-HI] and 9 co-sponsors introduced the first Federal level bill to raise the Tobacco age to 21 nationwide. This is both an important public health milestone and a resolute message to Tobacco companies that there are indeed congress members who will work to undo the incredible burden that Big Tobacco’s products have insidiously forced upon our nation. In a year in which dozens of cities passed Tobacco 21, the first state passed Tobacco 21, countless public health groups endorsed the measure, and public support soared to 75%, it is fitting that Tobacco 21 takes center stage at the national level for a moment. For decades Tobacco use has been the leading cause of preventable deaths in the United States, despite public awareness of its deleterious nature. Every year around 500,000 U.S. citizens die from tobacco use, which is more than the U.S. casualties in World War II. This may even underestimate the numbers, as every year more causes of death are found to be attributable to tobacco. Tobacco use also robs our economy of an estimated $289 to $332.5 billion a year. And while government struggles through red tape and misinformation to regulate the abundance of products that already exist, tobacco companies release scores of new products meant to attract the younger generations to a lifetime of addiction, as well as convolute the process of regulation. 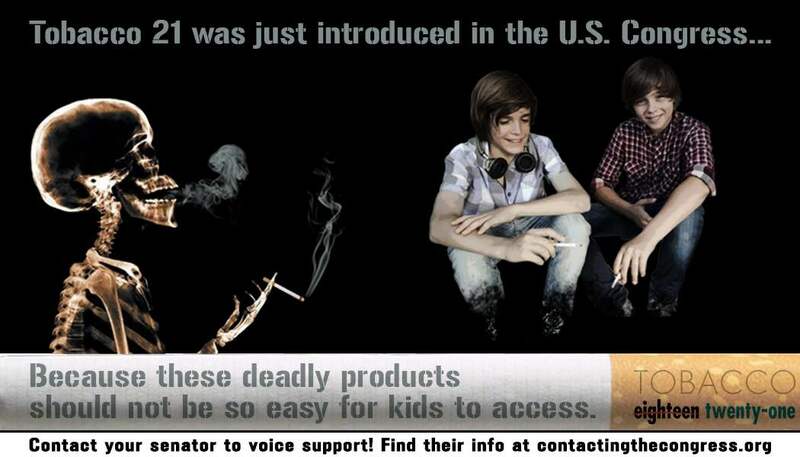 In fact, 700 U.S. kids become daily smokers every single day. Tobacco 21, instead, is an easy to understand enforce umbrella law that encompasses all tobacco products. 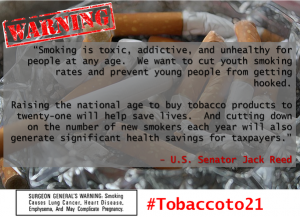 Easy to understand, easy to enforce, and with virtually no costs to taxpayers, Tobacco 21 is the next logical step in our prevention efforts.